It’s been a good year for good stuff online, and it ends well. Shawn Smucker has a good story that’s a reminder for fathers. Kathy Richards has something to say about all those Christmas gifts. Dave Wheeler writes a psalm. Tim Good has some spectacular photographs “form his desk.” T.S. Eliot reads about the magi. And much, much more. “I Dare Me” by Michael Perkins at the Handwritten. “Christmas Is Gone and I’m Glad” by Sandra Heska King. “Freelancing: Fiction and Reality” by Joshua Spotts at A Writer’s Mind. “A Reminder to Fathers for 2012” by Shawn Smucker. “Christmas Break” by Laura Boggess at The Wellspring. “Oh, you shouldn’t have” by Kathy Richards at Katdish. “Beyond Peaceful Facades” by Jason Stasyzsen at Connecting to Impact. “Steve Turner” by D.S. Martin at Kingdom Poets. “That My Hands Might Open” by Maureen Doallas at Writing Without Paper. “Nothing But Words” by Leslie Moon at Moondustwriter. “Psalm” by Dave Wheeler at Dave Writes Right. “Prairie Ramble” by Tim Good at Poetry by Tiwago. “Maddening” by Bradley Moore at And the Other Things Is. “And So I Sing” by Patricia Spreng at Lovepats. “The Oak in Winter” by Randall David Tipton at Painter’s Process. “Watching” by Susan Etole at Just…A Moment. “In the Winter, You Wait for Spring” by Kelly Sauer. “Photography ay Lockport Prairie Reserve” and “Photography from My Desk” by Tim Good at Photography by Tiwago. “Technology Disruptions” by Claire Burge. “Interview with Maurice Sendak” by the Tate Galleries. “The Journey of the Magi” read by T.S. Eliot. “Miniatur Wunderland” – the largest model railway in the world. “My Song is Love Unknown” by St. Martin’s Choir. Painting: Duccio di Buoninsegna. 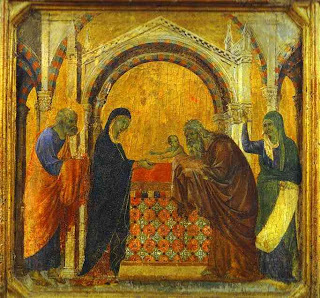 Maestà (front, predella): The Presentation in the Temple. 1308-11. Tempera on wood panel. Museo dell'Opera del Duomo, Siena, Italy. Last week, we visited the St. Louis Art Museum to see the Monet Water Lilies Exhibit. Because it was the final shopping week before Christmas, the crowds at the museum were non-existent. There was no waiting in line, no fighting to see a painting or poster illustration, no massive throngs to maneuver through. Yesterday, we returned to the art museum, to see an exhibit of American paintings 1900-1945 and a few other small exhibits. The museum sits within Forest Park, as does the Missouri History Museum, the St. Louis Zoo and the St. Louis Science Center. The weather was partly cloudy and high 50s. The park was packed. So was the museum. So was the Monet exhibit. I congratulated my wife on selecting last week as the time to see the Monet paintings. One of the paintings we saw was the one at the top of this post – “View of St. Louis” by Joe Jones. The museum had an entire exhibit of his paintings a year ago. As we were leaving, we walked through the temporary 16th-17th century paintings area (just about everything at the museum is in temporary quarters these days because of a major expansion program going on). And I saw this painting, one of my favorites in the museum – El Greco’s “St. 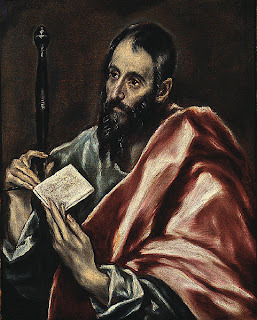 Paul.” It was painted between 1598 and 1600, and it simply does not look like it’s 400 years old. It looks almost like a contemporary painting to me. Perhaps it’s because the colors, or the expression on Paul’s face, but I always find it amazing. I’ve been reading a lot in the last two weeks (I’ve been on vacation time). I read A.E. Housman’s A Shropshire Lad and wrote a post about it for The Master’s Artist. 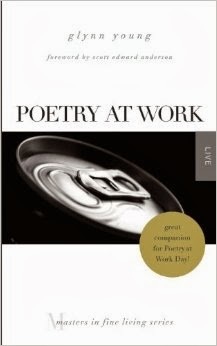 I read Alan Shapiro’s Night of the Republic: Poems and my review will be posted in January at TweetSpeak Poetry. I also read Dave Malone’s Under the Sycamore: Poems and Tania Runyan’s A Thousand Vessels: Poems and will be posting reviews of both, also at TweetSpeak. Other reading has included Work Matters by Tom Nelson and Amongst My Enemies by William Brown. I also finished a novel that I didn’t think I would finish. It had been recommended by a friend, who knows the author. It’s a kind of Generation Y novel, or at least the characters are Gen Y. I struggled with reading it and almost stopped at several points. One character kept me engaged – which, I suppose, demonstrates the power of characterization. But the novel needed an editor; it needed better plot development, for one thing. I suspect the original ending was cut off for length purposes – you never find out what happens to the villain. We saw the George Clooney movie, “The Descendants,” on Wednesday and “The Muppet Movie” last night. I really like “The Descendants,” but all of the characters, including the children, were required to drop the f-bomb at least five times each (scriptwriters should be able to do better than that). “The Muppet Movie” was nostalgic fun. We were young marrieds when “The Muppet Show” started its television run, and we loved both Muppet movies in the 1980s. This one had basically the same script as the others, and even a reprise of the song “The Rainbow Connection,” but it was still fun. We still hope to see "The War Horse" and the new Sherlock Holmes movie. Have you seen any good movies during the holidays? of black and white on gray paper. inspiring if ignored water lilies. but cameras are not allowed. On Tuesday, I posted “Navigating Monet’s Water Lilies,” about the three paintings that comprise The Agapanthus triptych currently on display at the St. Louis Art Museum. As I entered the large room containing the triptych, there was actually an artist seated in front of the Monet but focused on the drawing described here. Fortunately, I spent some time looking at Monet’s water lilies before I circled back to see what the artist was drawing. 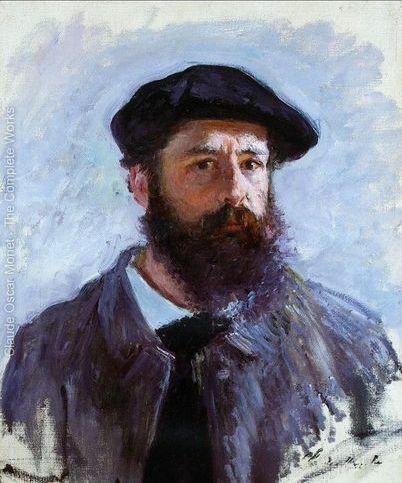 Painting: Self-Portrait of the Artist with Beret by Claude Monet. 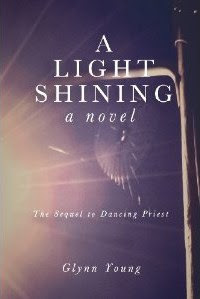 Last week, we talked with Michael Kent, the lead character and hero in the novel Dancing Priest. This week, we talk with Sarah Hughes, the lead female character. Faith, Fiction, Friends: We asked Michael this question, and feel somewhat obligated to ask you the same. What is it like to be a character in a novel? Sarah Hughes: Like your father is inside your head at all times. It’s strange at first but you get used to it. FFF: Can you tell us a little about your background, and where you grew up? SH: I was born and raised in Denver, Colorado. Likely the biggest impact on my life has been being a twin. My brother David was born two minutes before I was, and he never tires of reminding me he’s my older brother. We have an older brother, Scott, and there was quite a gap between us – 12 years. My father was an investment banker and then founded a venture capital firm with his best friend from college, Tyler Zimmer. My childhood was fairly normal, I think, for a family that was financially blessed. My parents sent us to private schools. David and I spent a good chunk of our summers with my paternal grandparents in Santa Barbara, although we didn’t see my mother’s parents that much. She was originally from Chicago; she met my dad when they all attended the University of Colorado. David and I were seniors in high school when our parents separated. Actually, that’s not quite accurate. My mother left my father, walked out on the whole family, in fact, and later married Ty Zimmer, Dad’s business partner. FFF: I detect some hurt there. FFF: Okay, then, how did you end up at the University of Edinburgh? SH: David and I went as exchange students. We were both attending UCLA, David for its British history program and me for its fine arts program. David had already planned to attend the University of Edinburgh for his junior year; he was specializing in the history of Scotland. At the last minute, and it was really the last minute, I decided to tag along. FFF: Wouldn’t staying at UCLA made more sense for your fine arts degree? SH: At Edinburgh I could take a lot of elective courses I needed and I decided it would be a good experience. I also wasn’t ready to be separated from my twin, to be honest. That was the main reason, I suppose. David and I had grown up together and been through a lot together, especially with my mother leaving the family. My dad was able to pull some strings to get my application reviewed; one of the professors there was a consultant for my dad’s business. FFF: What was your first reaction to seeing Michael? SH: We had just finished the first meeting of our medieval art class. Medieval art was about the last thing I was interested in, but the lecturer had a reputation for being an outstanding speaker and teacher. And he was, a wild Irishman who passionately loved his subject. I was leaving the building when this young man called out to me. He was in a cycling outfit – polyester jersey with “EUCC” across the front and spandex shorts, and dragging his bike along with him. He rather clumsily asked me out for coffee and I thought I was being hit on for the fourth time that day. I’m afraid I was rather rude. But he was nice looking, I will say that. FFF: What’s your most vivid memory of Edinburgh? SH: I know I should say something about the city or Scotland, but my most vivid memory is Michael. Everything about Edinburgh I now associate with Michael. Once we got past our problematic first meeting, it seems we did everything together. He even sat in on my art class just to watch me draw and paint and I attended his cycling practices. If I had to pick a most vivid memory of the city, it would have to be a kind of non-memory – when Michael and I danced the tango at MedFest. I was oblivious to everything during the dance except him. It was if we had known each other forever, and we had met only two days earlier. FFF: Are you looking forward to being in the sequel to Dancing Priest? SH: I have a yes-and-no answer. I’ve read the manuscript, and the best part for me is my life with Michael. But things are going to happen that I find frightening. We’re both going to face severe tests, and our lives will never be the same afterward. It wasn’t what I expected at all. allowing the voyage never to end. The three paintings popularly known as Monet’s “Water Lilies” are currently on an exhibition tour at the three museums who own them. Last fall, the exhibit was at the Nelson-Atkins Museum in Kansas City. Currently, it’s at the St. Louis Art Museum, and it will arrive at the Cleveland Museum of Art in February. The official title of the work is “The Agapanthus Triptych” for the African water lilies it depicts. This poem is submitted for Open Link Night at dVersePoets. To see more poems, please visit dVerse Poets. The links will be link at 2 pm Central time today. Painting: Monet’s Water Lilies, Cleveland Museum of Art. 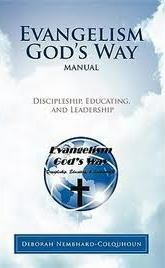 If you have need of resources on the subject of evangelism, there is now a manual that covers virtually every aspect in a simple, straightforward way – Evangelism God’s Way: A Manual by Deborah Nembhard-Colquhon. Do you want to know why evangelism is important? The manual has 17 reasons. Do you want to know what evangelism is? A concise explanation is right here. Do you want to know how to do it, and see all the various ways and styles? Look no further. The book is less a manual and more like a strategic and tactical plan, and in fact it includes a sample plan for how to approach evangelism. It covers every question I could think to ask. How do I do it? Is going door-to-door really effective? How do I answer common objections? The book also covers the objections (and fears) Christians themselves raise about evangelism, from offending people and invading their privacy to “this just isn’t my gift.” And there’s no question that evangelism is the one subject that will cause the most squirming among Christians. What is particularly helpful is the emphasis upon evangelism as a process – a lifelong process. There are ways to do it, and ways not to do it. You have to learn and be open to being taught. It is a part, a vital part, of your faith and who you are as a Christian. And in some way or another, we are all called to evangelize. Nembhard-Colquhon is an ordained evangelist with the Evangelism Association of Canada and the founder of Evangelism God’s Way Ministry in Toronto. The book has a slight focus on Canada (especially in the resources section) but is broadly applicable to all countries. After reading this, I find myself without excuses. This poem is submitted to dVerse Poets and its Christmas Poetry prompt. To see more Christmas poems, please visit dVerse Poets. It’s the end of Advent, which means it’s Christmas. This was a week in which many people online were writing about Advent and Christmas in prose, poetry, song and video. I’m also going to do something I haven’t done before, and will not likely do again – include something I wrote, “Unseen Christmas Presents” at The High Calling. I include it because it’s not about me but about a special group of other people who deserve recognition. It was a good week, and Sunday’s coming. “Wanting More” by Jay Cookingham at Soulfari. “Advent 4: Love” by Tony Maude at Grappling with Grace. “Writing in the Barn” by L.L. Barkat at Seedlings in Stone. “Leaders: Time to Affirm Work Well Done” by Bradley Moore at Shrinking the Camel. “Endless silent night” by Doug Spurling at Spurling Silver. “Behold” by Billy Coffey at What I Learned Today. "The Communicator's Prayer" from the Oxford Book of Prayer, via David Murray at Vital Speeches. 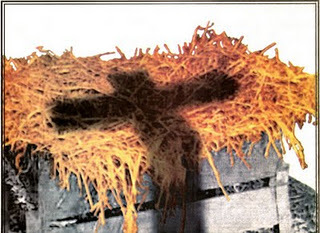 “Does Santa Believe in Jesus?” by Jennifer Dukes-Lee at Getting Down with Jesus. “A Rag Doll for Leah” by Louise Gallagher at Recover Your Joy. “Advent Journal: Innkeepers” by Milton Brasher-Cunningham at Don’t Eat Alone. “In the Absence of You” by Louise Gallagher at Recover Your Joy. “Adventus” and “Art Talk” by Maureen Doallas at Writing Without Paper. “Donald Hall” by D.S. Martin at Kingdom Poets. “I missed a week of Advent” by Jim Schmotzer at Faithful Skeptic. “A Strange Advent” by Diana Trautwein at Just Wondering. “And” by Brian Miller at WayStationOne. “Simple Ways” by Nancy Rosback at A Little Somethin’. “This Day” by Karen Eck at Karenee Art. “Connected to This Place” by Sandra Heska King. “As If a Dream” by Susan Etole at Just…A Moment. “Columbia,” oil on canvas by Randall David Tipton at Painter’s Process. “The Crown” by Tim Good at Photography by Tiwago. “The Christmas Song” by Tony DeSare. “Pie Jesu” by Sarah Brightman. “Motets and stuff” by Bird Dog at Maggie’s Farm. 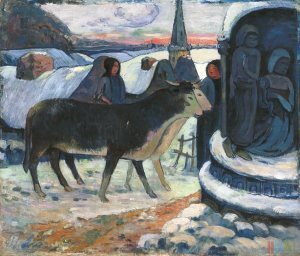 Painting: Christmas Night (Blessing of the Oxen). Indianapolis Art Museum. William Brown's "Amongst My Enemies"
I’m not a fan of movies or books about World War II. And I don’t normally read espionage thrillers. So I approached William Brown’s Amongst My Enemies with something akin to hesitation, because it’s a novel about World War II and its aftermath and Cold War espionage. But I had read and reviewed Brown’s novel The Undertaker and really liked it, so I thought I would overcome my usual reluctance and read this new one. I’d forgotten how much I could enjoy a good story, even if it is about subjects I don’t usually read. And Amongst My Enemies is one good, nail biting story. Michael Randall and Eddie Hodges are part of the American crew flying in a B-17 bomber. The plane is hit after a bombing run over Berlin; Randall and Hodges are the only crew members to survive. They’re eventually taken prisoner and find themselves part of a prisoner labor gang in the east Prussian city of Konigsberg. Hodges gets frostbite which leads to gangrene; he convinces his friend to help him kill himself and extracts a promise: Randall has to survive and tell Hodges’ family what happened – and the horror of Nazi Germany. Randall’s group of prisoners is forced to load a U-boat with all kinds of odd-shaped boxes – a U-boat reconstructed to carry cargo instead of torpedos. The operation is under the supervision of an SS officer, Heniz Kruger, who reports directly to Nazi chieftain Martin Bormann. What’s inside the boxes is to be shipped to Argentina. Among his other qualities, Kruger enjoys killing people. Randall is able to hide out on the U-boat but is found once the submarine is underway. The captain, “the last decent man in Germany’s military,” has Randall placed in a rubber dingy off the coast of Sweden. Minutes later, the U-boat is bombed and sunk by British fighter planes. The shell-shocked American spends the next three years with the Swedish fish boat captain who plucks him from the Baltic. And then he returns to the United States to keep his promise to his friend. I provide that detailed background because it sets the stage for what unfolds over the next four years. 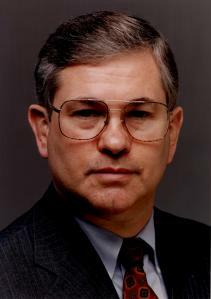 What Michael Randall knows about that U-boat will become of critical importance to the New York police, the new Israeli government, the Russians, the CIA and a very much alive Martin Bormann, who didn’t die as reported in the final days of Hitler’s Berlin. Bormann is very much alive in Bolivia – and has an able assistant named Heinz Kruger. And Bormann wants his U-boat. Brown has done an enormous amount of research in writing this novel, from the details of a U-boat interior and the fishing industry in Sweden to Nazi politics and legends and underwater salvage operations. The novel is a fast, exciting read – the author excels at keeping the reader both gasping for air and reading on. I still may not be a fan of World War II and espionage novels, but I am becoming a fan of William Brown. Amongst My Enemies is a highly entertaining novel. My review of Brown’s The Undertaker. One of my favorite movies about the birth of Christ is The Nativity Story, released in 2006. One of the reasons is that it has more about the character of Joseph than most nativity movies. But then he has a dream, and an angel of the Lord explains what’s happening. The account is not as lengthy as that of the angel and Mary in the Gospel of Luke, but it’s clear that Joseph does exactly what Mary did: he obeys. He “did what the angel of the Lord commanded him to do” and takes Mary into his home as his wife. And when the baby is born, it is Joseph who obeys once again and names the baby Jesus. He takes the pregnant Mary to Bethlehem for the census, and he was most likely with her when the baby was born and may, as the movie suggests, have helped deliver the baby (there wasn’t anyone else around in the manger). Eight days later, he and Mary bring the baby to the temple “to be consecrated to the Lord,” required for every firstborn male. While the timing isn’t exactly certain, we know he was with Mary when the Magi visit and present their gifts. And then Joseph has another dream, where the angel of the Lord warns him that Herod is out to kill the child and to take Mary and Jesus to Egypt. After Herod dies, Joseph has a third dream, and an angel tells Joseph to return to Israel. We can deduce that Joseph taught Jesus to be a carpenter. We know that Jesus had half-brothers, and that Joseph would have been the father (whether you believe Mary was their mother depends upon whether you accept Protestant or Catholic teaching). But we do not know anything else about Joseph – his age, when he died, what he thought about raising Jesus, whether he had doubts like Mary seemed to have at times, or what his personality was like. And nowhere does Jesus mention or refer to Joseph. We know he was a righteous man. We know he obeyed what he was commanded to do – three times. We know he trained Jesus in his trade, as any father would have done at the time. His job, one that he accepted in rather unusual circumstances, was to protect Mary and the baby, and then to raise the child as his son. He protected his family from both physical harm and the shame that would have attached itself to an unmarried mother and illegitimate child, especially in a small town like Nazareth. He was an ordinary carpenter who was called to do extraordinary things, and he obeyed. Over at Faith Barista, Bonnie Gray is asking the question, what character in the Christmas story is speaking to you this year? To see how others answer the question, please visit Faith Barista. 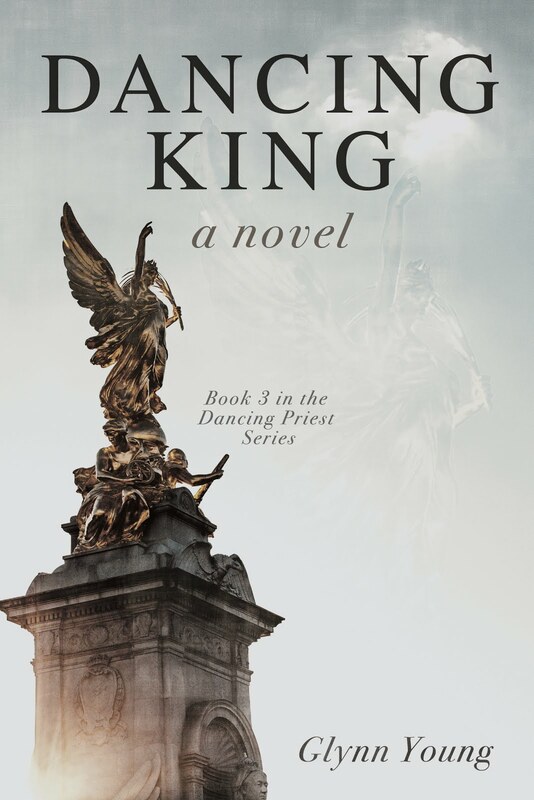 We caught up with Michael Kent, the lead character and hero of the novel Dancing Priest, and he graciously agreed to answer a few questions about his background and his role in the book. Faith, Fiction, Friends: So I have to ask. What does it feel like to be the main character in a novel? Michael Kent: Rather strange, actually. You constantly have to deal with someone putting words in your mouth. Ha! Seriously, it is a strange experience. You’re not only watching a story unfold but you find yourself part of that story. FFF: What do you recall of your early childhood, before you went to live with your guardians in Edinburgh? MK: Not much, I’m afraid. I recall the house as large, but that could have been because I was a child and things always seem bigger. I vaguely remember my parents, but I had just turned six when they were killed. FFF: They died in a car crash? MK: Yes. They were on their way to London when a lorry driver lost control and smashed into their car. I didn’t understand that at the time but my Da, my guardian Iain McLaren, explained it later. 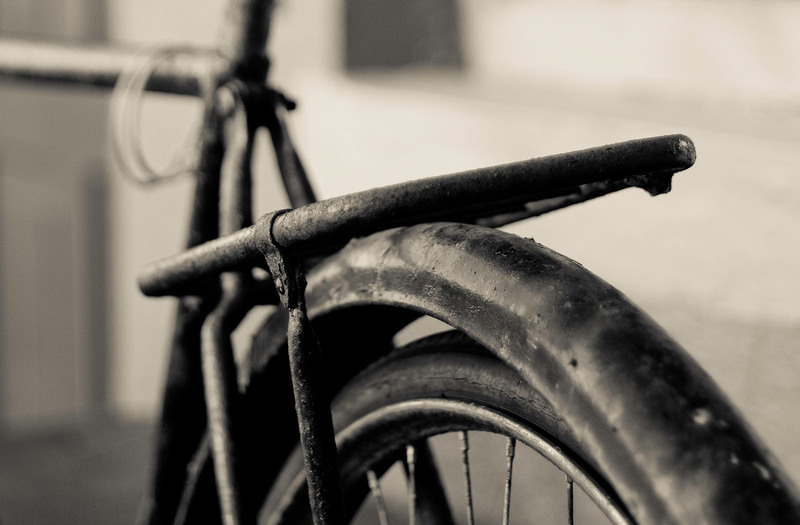 FFF: How did you come to be interested in cycling? MK: The one very vivid memory I have of my early years was Tony, the family driver, teaching me to ride a bike. He’d been a professional cyclist but a serious injury during a bike race ended his career. He still loved cycling, though. I can remember him talking through the big races in Italy and France, using maps that showed the routes. Today I know the races to be the Giro d’Italia and the Tour de France. He had put up the route for the Vuelta in Spain when my parents died and everything changed. FFF: How did you natural parents meet? MK: At a cancer hospice in Kent. Both of their spouses were there for treatment, although I understand the hospice generally accepted only terminal cases. FFF: How did you meet your closest friend Tommy McFarland? MK: At school. My guardians enrolled me in a private grammar school, and the fact I was English invited a fair amount of bullying, unfortunately. One day it began to get out of hand and some boys starting pushing me around, and Tommy came to my defense. We both ended up with black eyes, and from then on we were inseparable. We spent all of our school years together and then roomed together at university. FFF: How did you decide on the Anglican priesthood? MK: My guardians are Presbyterian and evangelical, and that’s how they raised me. There was an Anglican church, St. Bartolph’s, not far from our house and on the way to school. When I was old enough to bike to school, I rode by the church every day, at least during the spring and early fall. One day I stopped and went inside. 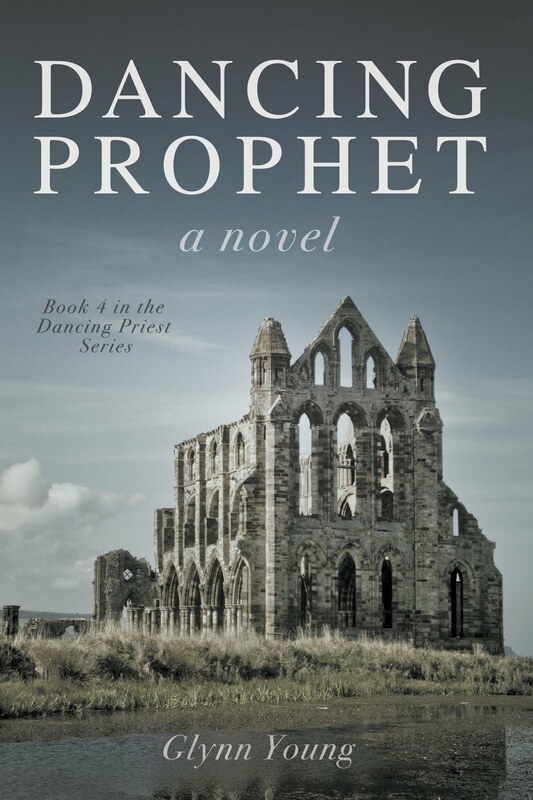 I met Father Andy – Andrew Brimley – and got to talking with him. He was a young priest and as evangelical as my guardians. He hired me to do odd jobs during the summer. He became a kind of hero for me, I think. 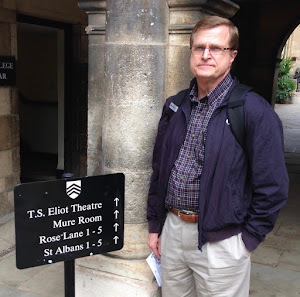 When I was 16, I prayed about becoming an Anglican priest, and my path forward became clear. FFF: Yet you didn’t attend a traditional seminary. MK: No. I wanted the experience of university, and Edinburgh had a program that was the equivalent of seminary training. And, to be honest, Edinburgh also had a cycling team. FFF: It’s described in the novel, but could you expand upon your reaction to seeing Sarah Hughes for the first time? MK: Which part, my heart palpitating, my hands sweating, my ears burning or the feeling that I had just glimpsed the woman who was to become part of me, and me part of her? (Laughs.) There I was sitting in a class on medieval art, and there she was, a few rows in front of me. I was overwhelmed. It wasn’t just her physical beauty, although that would have been enough, I suppose. I think I also sensed something about her, and about the two of us. It was like you just know. I had dated before, but nothing lasted, or lasted for very long. When I saw Sarah, though, I knew. FFF: Do you have plans for being in a future novel? MK: I think that’s the plan. I’ve seen the manuscript, and while there are some edits I’m going to suggest, I can say it takes a very different turn from Dancing Priest, a very dramatic and surprising turn. I didn’t expect it at all. 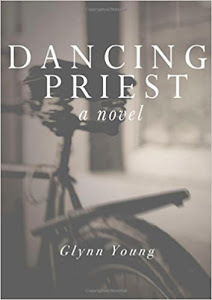 Editor’s Note: Dancing Priest is available in e-book and paperback formats at Amazon and Barnes and Noble and will soon be available a Books-A-Million. Shawn Smucker's "My Amish Roots"
"I Just Had to Publish It"